How can I synchronize ID3v1 or ID3v2 tags? Home > How to use tips > How can I synchronize ID3v1 or ID3v2 tags? MP3 files can contain the ID3v1 tags and ID3v2 tags. All audio players (software and hardware) correctly display ID3v1 but not all players correctly display ID3v2 tag or tags with the UNICODE characters. All players correctly display the ANSI characters only! Hint: you must use ID3v1 and ID3v2 tags on your MP3 files for the maximal compatibility with your audio players. ID3v2 tags will be with your national characters and ID3v1 tags will be with the ANSI characters. 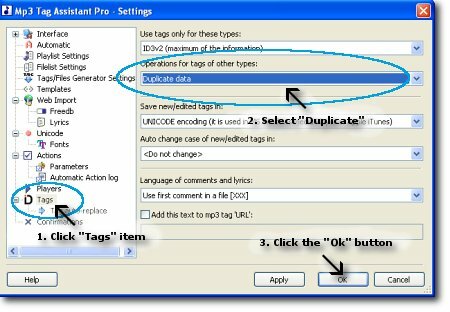 You can synchronize ID3v1 tags and ID3v2 tags manually (using copy/paste for example) but it is better using automatic tag synchronization. You can use this feature at saving of the new or changed tags. Open the program "Settings dialog", select "Tags" tree item and select "Duplicate data" for "Operation for tags of other types" combobox (see Figure 1). Now new tag values will be written to the ID3v2 and ID3v1 tags. You can copy ID3v2 tag to ID3v1 tag (synchronize ID3v2 to ID3v1) if you MP3 files have ID3v2 tags only. Please open "Tag synchronization dialog", select type of synchronization and click "Save to files" button (see Figure 2). Using this dialog you can copy (synchronize) some ID3v2 tag values to ID3v1 tags: Title, Artist, Album, Year, Comment, Track and Genre. You can synchronize ID3v1 to ID3v2 tags also. © May 19, 2008 by AssistantTools.com. All rights reserved.